I INTRODUCED OUR four-year-old to Google Plus first because I wanted her to see the effect of upvoting in a system that made sense to her. There are 10 reasons that bring her back to G+ nearly every day. 1. 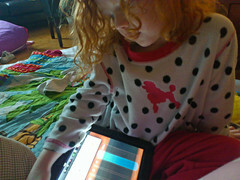 Google Plus aggregates her phone's photos for her. "Look! My pictures are on the computer." 2. It's for her to see fresh items without using the J Key. Sorting by "Most Recent" is a default. 3. She gets information in front of her, not App Crap pushed to her. 4. Google+ keeps things "limited" to a tight group of family and friends. 5. She doesn't have to see strange gibberish like Foursquare check-ins all over the place. 6. She can see where her photos went by using Ripples. 7. She likes looking at new things in "What's Hot". "It's just like the telebision (sic)." 8. She sees real people with real things in circles. 9. She gets an email address. 10. She sees really good photographs. Bernie Goldbach curates links about G+. Post inspired by Chris Pirillo.